With the national healthcare industry undergoing radical change in recent years and companies making healthy employees a priority, new strategies and tactics are needed to engage and influence participation in wellness initiatives. According to Willis North America 2015 Health and Productivity Survey, 66 percent of employers said their employees’ health habits were their biggest concern when it comes to managing rising healthcare costs. Creative incentive marketing using reward programs are extremely effective and affordable for companies looking for proven tactics to incent employees to behave in ways that align with their wellness program goals and objectives. Effective wellness incentive programs empower employees to participate in and sustain healthy behaviors while decreasing healthcare costs. Flexibility and excitement are the cornerstones to the success of a company’s incentive programs. Senior management at companies all over the world struggle to find the right solution for incentive programs often finding that one size does not fit all. 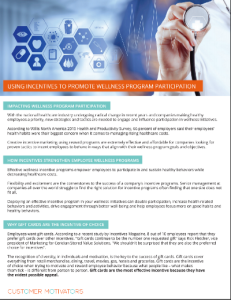 Request a copy of our white paper and learn how an effective incentive program can encourage wellness program participation, double participation, increase health related behaviors and activities, drive engagement through better well-being and help employees focus more on good habits.